Finally completed my 4th of July firework stash after this one last trip to the firework store! Psh, we all know I'll be back there soon! Got a ton of great product and I will be posting the stash video in the next day or two! These videos are taking a lot longer to process and edit than I thought! I also have a ton of content coming your way so keep watching for those new videos! Firework-shopping-trip Finally completed my 4th of July firework stash after this one last trip to the firework store! Psh, we all know I'll be back there soon! 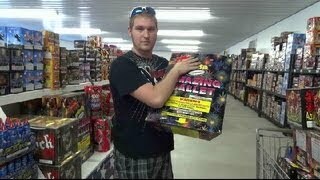 c4 fireworks shopping trip Took a trip to C4 Fireworks at 1408 Charlestown New Albany Road Jeffersonville, IN! Enjoy the shopping trip/tour of the store! 2013 4th of July Fireworks Setup!